E-mail is one of those mixed blessings. You have to be thankful for it, but it can be a disgrace when it’s out of control. Thankfully, networks on Ning give you very fine control over what e-mails you receive. Messages Sent to Me: Your friends on the network can send you private messages in your inbox on the network. If you deselect this check box, you find out about private messages sent through the network only by checking your network inbox. Messages Sent to Groups I Belong To: Some groups on the network may allow members to send messages to all the members in the group. 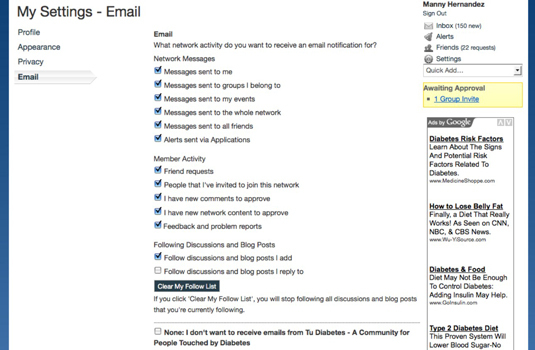 Deselecting this check box ensures that you don’t get e-mails when messages are sent to groups you are a member of. Messages Sent to My Events: The creator of an event can send a message to all event guests at any time. Messages Sent to the Whole Network: Unless you’re getting overwhelmed with broadcast messages from your network, leave this check box selected because you may otherwise miss important communications from the network’s head honchos. Messages Sent to All Friends: Occasionally, other members may choose to send a message to all their friends. Alerts Sent via Applications: Networks on Ning give you access to applications, some of which can send alerts. Friend Requests: When someone in the network sends you a friend request. People that I’ve Invited to Join This Network: When someone you invited to the network becomes a member, you get notified. I Have New Comments to Approve: When someone posts a comment on your profile page or on any content you have added, and you have turned on comment moderation from the Privacy page in your network’s Settings, you get a notification. I Have New Network Content to Approve: This option applies only to Administrators. Feedback and Problem Reports: This option, too, applies only to Administrators. Follow Discussions and Blog Posts I Add: You receive e-mails when someone replies to a discussion or blog post that you start. Follow Discussions and Blog Posts I Reply To: You receive e-mails when someone replies to a discussion or blog post that you reply to. From time to time, wouldn’t you like to unplug yourself from all conversations that you’re part of? Networks on Ning give you that option. If you click the Clear My Follow List button at the bottom of the Email page, you stop following any discussions and blog posts that you’ve been following until then. Handy, huh? Last, at the very bottom of the Email page lies the None check box — if you check this box, you receive no e-mails from the network at all. Selecting this option makes sense only if you feel overwhelmed by the sheer amount of messages you’re getting from the network.